For many people, the name “French Connection” conjures up memories of a 1971 film starring Gene Hackman. For others, it’s a notable fashion brand, based in the UK that was founded not long after that film came out. Among their many fashion offerings are French Connection watches. You’ll find that these watches are much like those of other companies whose primary interest is fashion, rather than wristwatch manufacturing. Still, if you’re a fan of the brand, you might want to know a bit more about their watches. 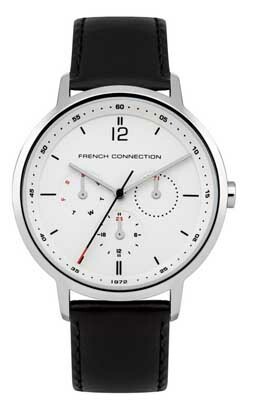 Read on for the full French Connection watches review. Glass is adequate for a budget watch, but not as hard as the sapphire crystal you’d find on more expensive timepieces. Bracelets are made from either stainless steel or leather, depending on the model. Water resistance is modest; most models are rated at 30 meters, which is misleading. 30 meters of water resistance means that it’s OK to get them wet, but that you shouldn’t go swimming or even bathe while wearing them. We’ll be honest, we haven’t been able to find out a whole lot about the construction. We suspect that they’re made in China, and if that’s the case, they’re likely using Japanese-made movements. All of the brand’s watches that we’ve seen for sale anywhere are described as having “quartz” movements, with no indication as to who made them. Still, these days, most quartz movements are both accurate and reliable. The technology is now almost 50 years old, and they’ve pretty much gotten the bugs out of it by now. You aren’t going to find any technical innovation here. These timepieces are made by third parties to function as fashion accessories, and the company isn’t a watch manufacturer, per se. That being the case, you’ll find typical features such as a sweep second hand, a date complication, a day/date complication, dual time zone, and one or two models that feature a chronograph. That should be good enough for most buyers; if you’re looking for elaborate complications, French Connection watches wouldn’t be a good choice for you. The styling is fairly basic, with emphasis on silver-colored cases and watch faces that are black or white. All the models that we’ve seen have analog displays, though a few have multiple analog dials. All but one of the models we’ve seen had a round face, and sizes tend to the large size, even for women. You should expect case sizes in the 40mm-44mm range, and a bit (but not much) smaller for the few women’s models offered. Everything in the product line is stainless steel; there isn’t any gold, platinum, or gemstones to be found. 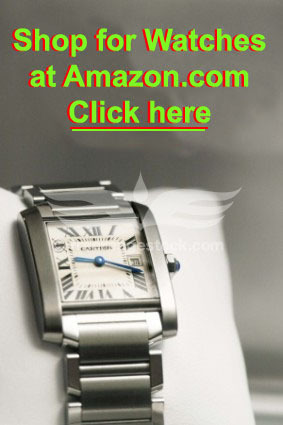 Then again, these are relatively modestly priced watches, so you wouldn’t expect to find such things in the product line. Most of the models are designed for men; there are only a few women’s models available and even they have somewhat of a unisex look to them. Care and maintenance is straightforward, as all of these timepieces have battery-powered quartz movements. You’ll need to have the battery replaced every 2-3 years, and you should store French Connection watches away from extremes of temperature and strong magnetic fields. With proper care, you should get a few years of use from your watch. The warranty offered with French Connection watches is the industry standard of two years. That will protect you against defects in materials and craftsmanship. These watches are well-tested at the factory, so defects are likely fairly unusual. As you might have gathered if you’ve been reading up until now, French Connection watches are relatively inexpensive timepieces. They don’t have rock-bottom prices, but they’re at the low end of the spectrum as designer watches go. Prices range from a low of about $35 to a high of about $199 or so. Prices may vary slightly from one retailer to another, but that range will represent the bulk of the models that you’re likely to encounter. 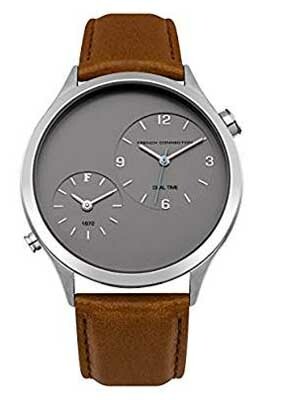 Most models of FCUK watches are priced at $100 or less, making them affordable for just about everyone. You can likely find them for sale wherever you’d see the brand’s fashion products offered for sale. You can find them for sale at the company’s official Website, though the site is based in the UK, and that may not be the most affordable option for U.S. customers. You can also find them for sale at a number of online retailers, and that may represent your best opportunity to buy them at a discount, as online retailers are often in a position to sell at lower prices than brick and mortar stores. If you’re looking for a robust, feature-laden wristwatch with gold, complications, or gemstones, you’re not going to have much interest in this brand. 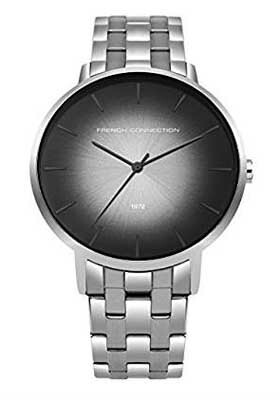 On the other hand, if you like simple, clean designs in basic colors, and a watch that will look good and run well without costing you a fortune, then French Connection watches might be a good choice for you. They look nice, have some nice features, and won’t cost a fortune.